This behemoth will help search the cosmos for signs of life. The world’s largest single-dish radio telescope started operations over the weekend, after completing its five-year long construction period. Installation of its 4,450 panels was finished in July, right on time for their September 30 completion goal. 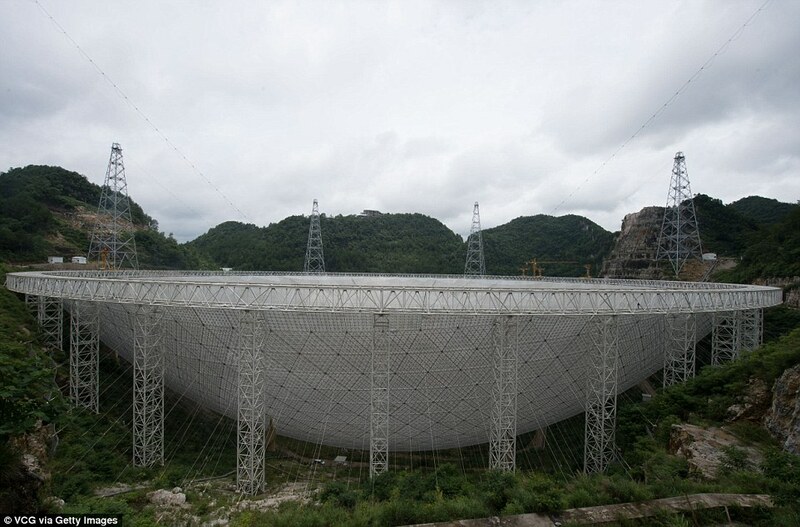 Perfectly cupped by a natural basin on the side of a mountain in the south-western province of Guizhou, China, the 500 meter (547 yard) Aperture Spherical Telescope (FAST) requires a five kilometer (three mile) radius of radio silence. To accomplish this 8,000 people from eight neighboring villages had to be relocated. In its quest to gain international scientific prestige, the Chinese government spent around $269 million in poverty relief funds and bank loans for the relocation of nearby residents on top of the $180-million building cost of the telescope itself. The 500 meter wide radio telescope topples previous record-holder Arecibo Observatory in Puerto Rico not just in size, the structure is about twice as sensitive and between five and ten times as fast in surveying. The telescope has received the nickname of Tianyan, or the Eye of Heaven. FAST aims to find out more on the greatest mysteries of our universe such as dark matter and dark energy, and would also seek out gravitational waves and radio emissions from stars and galaxies, and possible signs of intelligent extraterrestrial life. “In theory, if there is civilization in outer space, the radio signal it sends will be similar to the signal we can receive when a pulsar (spinning neutron star) is approaching us,” Qian Lei, an associate researcher with the National Astronomical Observatories of the Chinese Academy of Sciences, told online news channel CCTV.